A young boy can see and summon mischievous ghost-like creatures with the aid of a special watch. 5. 1-5                 05 Feb 14   Manjimutt: Part 4 / Yo-kai Illoo / Let's Exorcise! 9. 1-9                 12 Mar 14   Komasan in the City: Here's Komajiro / Yo-kai Cadin / Robonyan Activate! 58. 1-58                27 Feb 15   Yo-kai Gimme / Yo-kai Tublappa / Kaptain Komasan! 65. 1-65                17 Apr 15   Kaptain Komasan and the Surprise Ending / Sour Milk? 77. 2-1                 10 Jul 15   Usapyon is here! 91. 2-15                16 Oct 15   Let's Sing Together! Yo-Kai Red and White Song Battle! 110. 2-34                04 Mar 16   Year 3 Class Y, Mr. Nyanpachi: Gyan Gyan Academy / The Way Back Is Backpack Rock-Paper-Scissors! / Evil Year 5 Class 1: Netaballerina Sinks Into the Sea of Knowledge!! 119. 2-43                06 May 16   Start Your Engines! The Yo-1 Grand Prix! 130. 2-54                22 Jul 16   Tomnyan Appears! 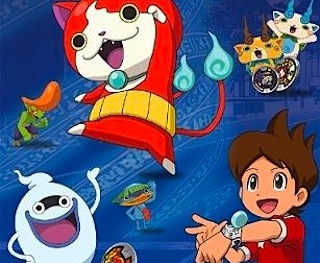 Let's Get the Yo-kai Watch Dream! 152. 3-2                 06 Jan 17   Komasan and Koma-jiro's All Japan Mongee Tour: In Osaka / Ina-Usa Yo-kai Mystery File 1: UFOs / Try it Out! Yo-kai Bazooka! 153. 3-3                 13 Jan 17   Komasan and Koma-jiro's All Japan Mongee Tour: In Nagoya / Momotaro-nyan's Oni Extermination of Steel! / Decisive Battle! Refusing to Get out of Bed Championships! 165. 3-15                07 Apr 17   New School Year! The recently returned Teacher Nyan-pachi vs GTA / Komasan and the First Graders / Let's Think About new Stories! Meeting about New Yo-kai Series! 179. 3-29                14 Jul 17   Dai dai dai bōken! Basutāzutorejā! 194. 3-44                27 Oct 17   It's Great King Enma's Yo-kai Halloween, nyan! 199. 3-49                01 Dec 17   Basutāzutorejā-hen# 19 Are batchīno futatabi!